Coming atcha today with an ever so relevant post for all you slackers out there with no plans for Mother’s Day! If you’re looking for a way to celebrate the mom in your life here are five ways to make her feel special this Sunday or any day. Visit a Winery – If I were a mom I think this would be top on my list. There are family friendly wineries for mom’s with little ones, but if you really want to treat mom, find a sitter for the kids and give her a day of wine tasting sans children. My mom and I have plans to visit a winery later this summer when the weather is more consistently good. My fave is Sugarloaf Mountain Vineyard. Brunch – the Mother’s Day standard! You might be hard-pressed getting a reservation at the last minute, but could try your luck at some of the local places that don’t take a res like, Spoons and Blue Moon. Something Active – play tennis or a round of golf. Take a walk. It’s all about spending time with your mom and doing something she enjoys. Our family tradition is to participate in Race for the Cure – we’ll be walking in our 8th race tomorrow. Spa Day – Get your mama some much deserved pampering! I can’t imagine a more relaxing Mother’s Day than a trip to the spa for a massage, mani/pedi or facial. Do you have plans for Mother’s Day? What’s your favorite way to celebrate Mom? 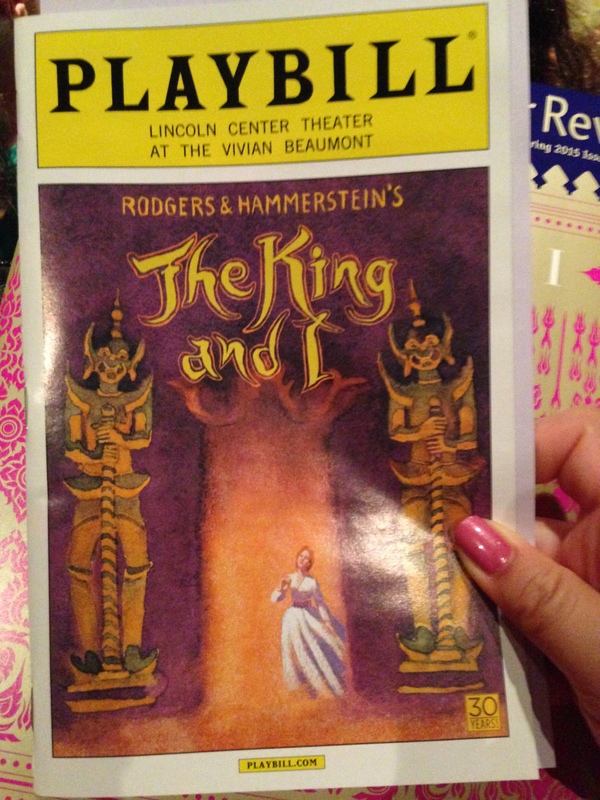 The King and I at Lincoln Center – We made the trip up for my mom’s birthday and took in a matinee of The King and I. My mom said it was the best Broadway show she’s ever seen and I have to agree that it’s up there in my top five (for me, nothing beats seeing Catherine Zeta-Jones and Angela Lansbury in A Little Night Music). The music was fantastic, led by Tony winner Kelli O’Hara, and the dancing, costumes and set design were all top notch. 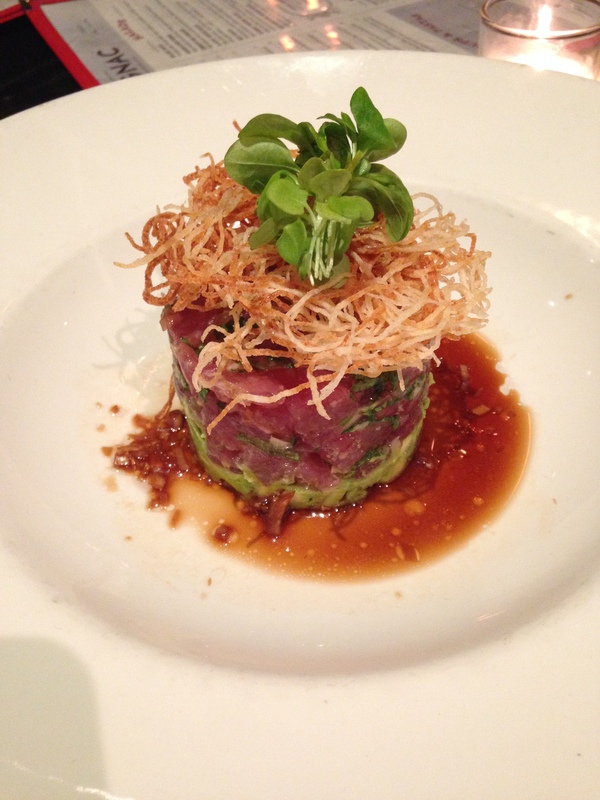 This tuna tartare – We met up with my friend Jessie and celebrated my mom’s birthday with dinner at Brasserie Congnac. I thought the food was good, but nothing remarkable. The exceptions were the cocktails and this incredible tuna tartare. After dinner we ventured down the street to Tanner Smith’s, a speakeasy-type bar in Midtown. They had a fun cocktail menu, great atmosphere and live music! Central Park – I lucked out with awesome weather both weekends and spent some time with my mom and friends walking through Central Park. If you are a dog lover, there is no better place to see dogs of every size and shape and some in sweaters! Italian meal at Rosina – On my most recent trip to NYC, I spent time with high school friends and we had an amazing meal at Rosina. We shared a bottle of white wine, a salad and three delicious entrees. 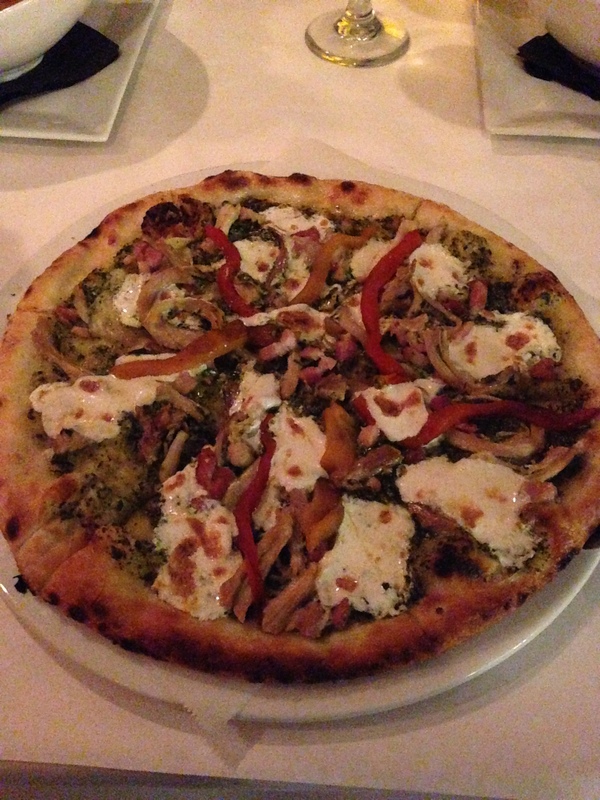 The eggplant penne and chicken pesto pizza were both delicious but the show stealer was definitely the pappardelle with clams, salmon, shrimp and scallops in lobster cream sauce. So rich and creamy and the seafood was fantastic. 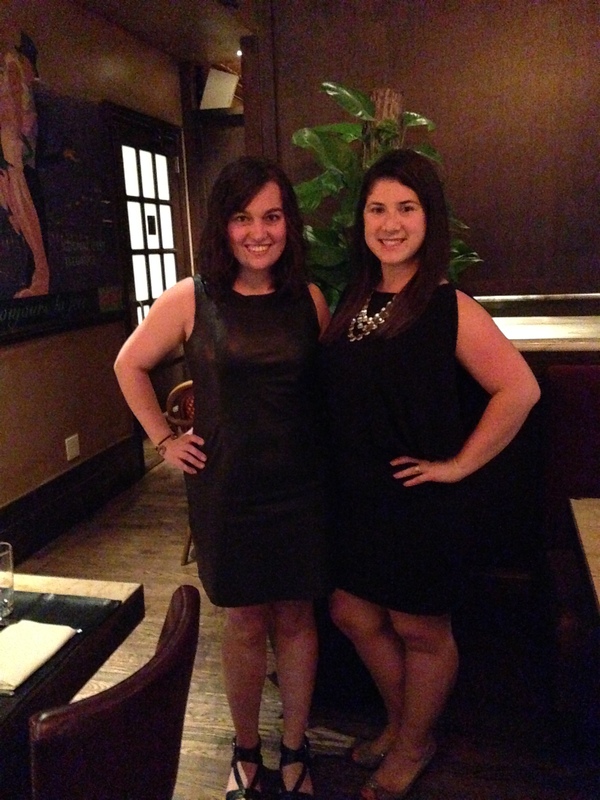 Our night didn’t end there, we walked off our meal by venturing a few blocks downtown for drinks at Penrose. We told our friend that we wanted a bar that felt “New York-y” but had drinks in the $12 range as opposed to the $20 range. Penrose definitely fit the bill! 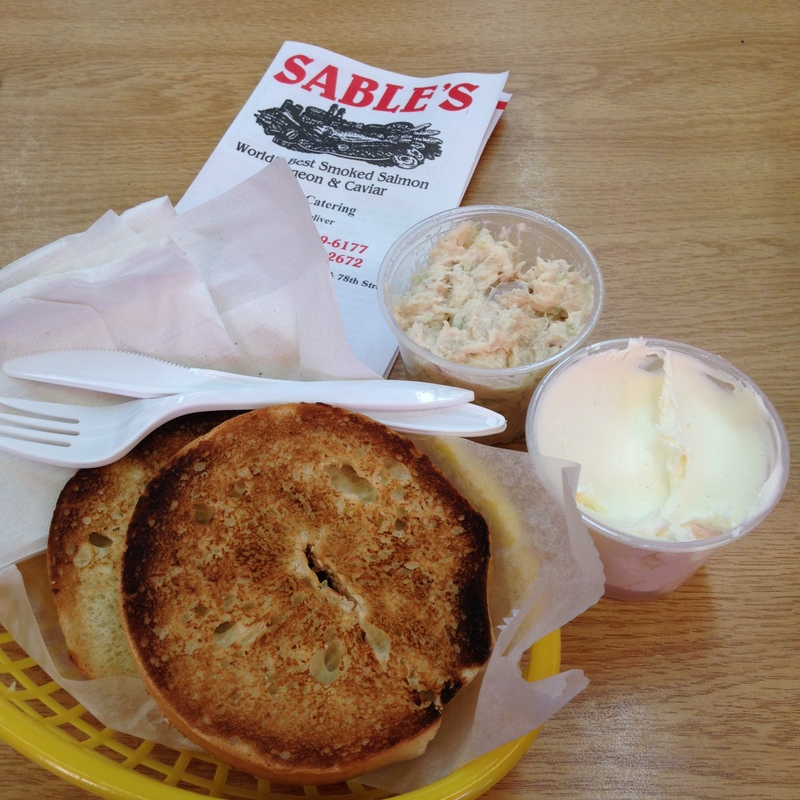 Real NYC Bagel – Sunday morning started with a trip to Sable’s for bagels and cream cheese. My friends got lox which looked delicious but I took things a step further with some of their whitefish salad. My husband got me hooked on the salty fishy spread and though I don’t get it often, there’s something about a real New York City deli that just demands I order it. Turns out it is the perfect hangover food! After we fueled with bagels and coffee we were ready for more exploring! 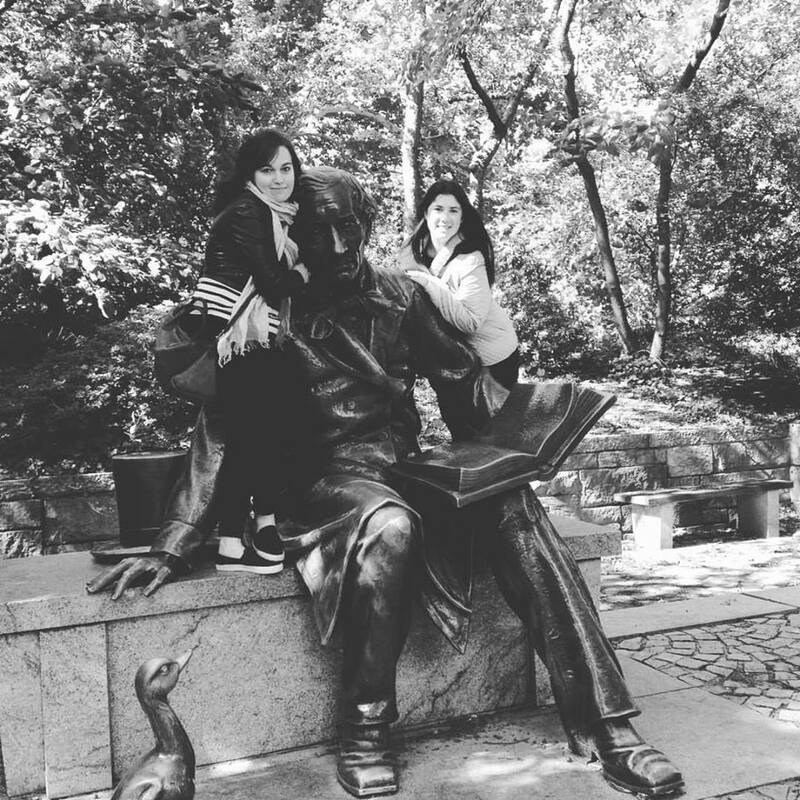 Other NYC highlights? Meeting my friend’s baby for the first time! Baby Frankie is just a couple months old but was a very well behaved boy at brunch at the Dutch (where I had a delicious but overpriced $18 turkey sandwich). Manicures and shopping with my girlfriends and visiting family in Brooklyn. What do you like to do in New York? Linking up with Heather for Friday Favorites. It has been hot, hot, hot in Baltimore and my favorite way to beat the heat is with a nice cold beverage. Thanks to Mar, Cynthia and Courtney for hosting a Friday Five linkup ALL about our choice summer libations. 1. I am a sucker for a good margarita paired with chips and salsa. Unfortunately they are like a million calories, luckily Papi’s Tacos in Fells has a skinny rita on the menu and it is fantastic! And the tacos aren’t half bad either. 2. Okay scratch what I said about calories, I make an exception for my beloved Strawberita. This Bud Light Lime beer margarita is not for everyone, it is wickedly sweet and quite alcoholic and most of my friends turn up their noses at it. I however happen to adore it and think a strawberita tall boy is the perfect drink for an afternoon picnic or day at the pool. 3. 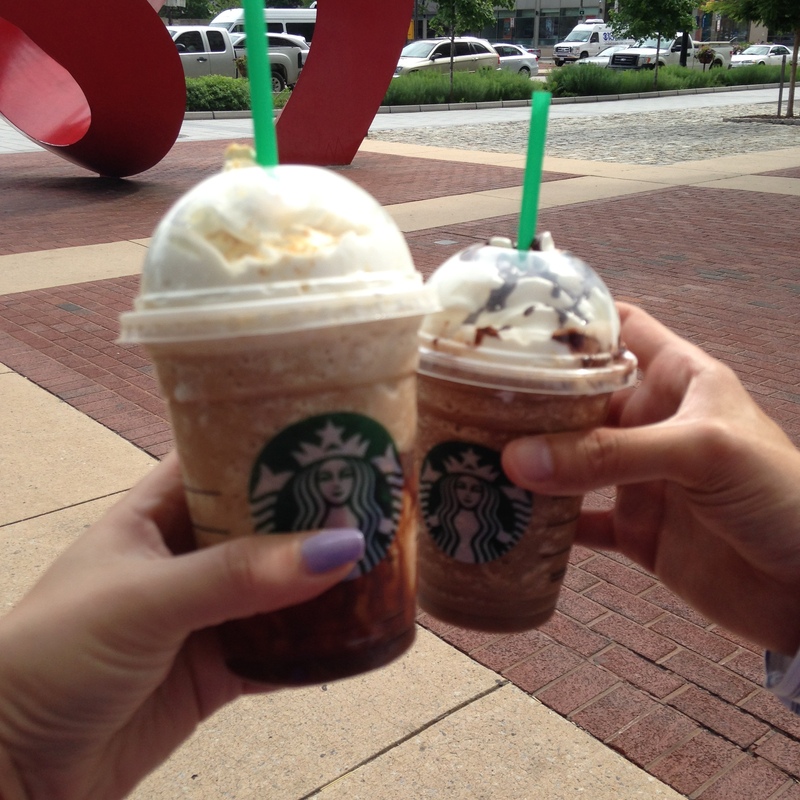 Back in high school, before I liked coffee, I would always order a frappuccino anytime we went to Starbucks. In the subsequent years I have hardly ever indulged in the frozen treat, but this summer I have been craving them like crazy! Adam and I both walk home from work and occasionally meet up at Starbucks for an evening “frappy hour”. I am all about the new s’mores flavor – have you tried it?! 4. I am a big fan of wit beers and summer is the best time to enjoy the lighter, slightly fruity taste of a Hoegaarden or Allagash White. My favorite beer bars in Baltimore: Max’s and Ale Wife. 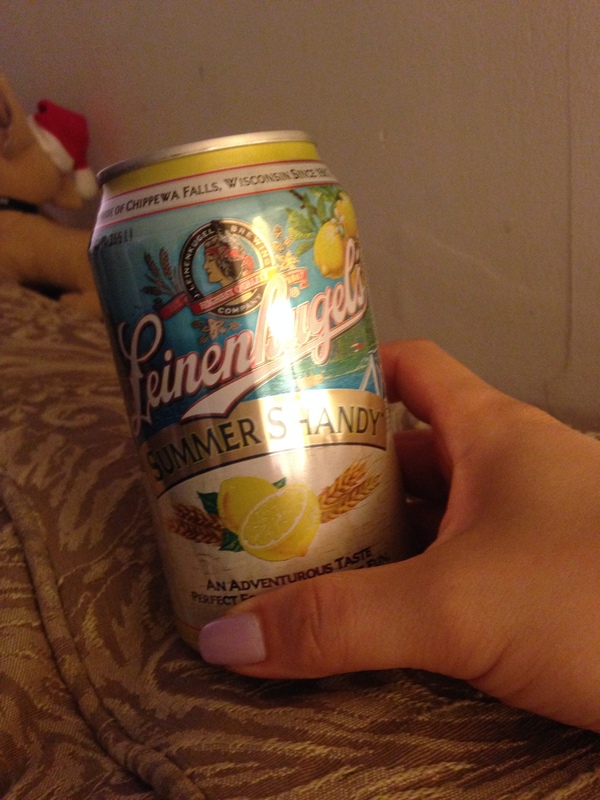 And when I want something even fruitier, Jeanette has got me hooked on Leinenkugel’s Summer Shandy. 5. Good ol’ H2O. Obviously there is nothing more thirst-quenching and refreshing than a nice cold glass of water. I have definitely been getting my recommended eight glasses a day! 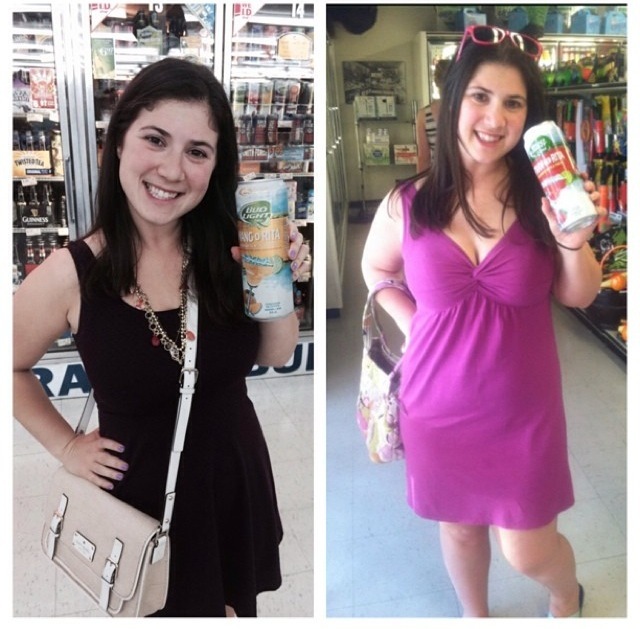 What (and where) have you been drinking this summer? Anyone know a good place to get a spiked lemonade in Baltimore?